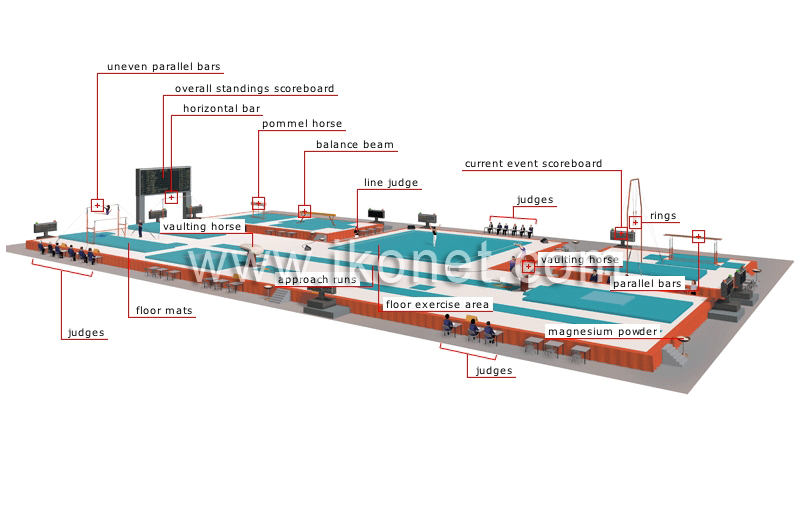 Platform that contains the necessary material and apparatuses to hold gymnastics competitions. 25 m runs made of foam matting; they allow gymnasts to gain the speed they need to execute an exercise. 12 m2 pad on which the gymnast performs exercises on the floor. Official who ensures that the gymnasts on the floor stay within the floor exercise area. Women’s gymnastics apparatus made up of a long horizontal bar, on which the gymnast performs static and dynamic balance exercises. Men’s gymnastics apparatus with two handles (pommels), around which the gymnast maneuvers. Board on which the performances and the gymnasts’ marks are posted. Women’s gymnastics apparatus made up of two horizontal bars of different heights for performing various acrobatic exercises. Men’s and women’s gymnastics apparatus that is similar to a pommel horse; after a run, the gymnast supports the body on it with both hands to make a jump. Men’s gymnastics apparatus composed of a horizontal bar attached to uprights, around which the gymnast maneuvers (rotations, flight elements). Padded carpets that cushion falls and provide balance when landing. Officials who evaluate performances on the uneven parallel bars. Officials who evaluate the performances on the vaulting horse (women). White magnesium-based powder that absorbs sweat from the gymnasts’ hands; this provides a surer grip on the apparatuses. Men’s gymnastics apparatus made up of two horizontal bars set at the same height; they are for performing various acrobatic exercises. Men’s gymnastics apparatus made up of two rings that hang from cables, which are fixed to a frame; they are used especially for power elements and fast swing exercises. Officials who evaluate floor exercises. Judges grade exercises performed by the gymnasts based on execution, technique and artistic value.